BJP supported independent candidate Sumalatha Ambareesh had filed a complaint against Mandya deputy commissioner stating that the DC had been partial towards JD(S) candidate Nikhil Kumaraswamy. Bengaluru: The Election Commission has transferred Mandya deputy commissioner Manjushree. However, there has been no specification of her new post. BJP supported independent candidate Sumalatha Ambareesh had filed a complaint against the Mandya DC stating that she had been partial towards JD(S) candidate Nikhil Kumaraswamy. Sumalatha had earlier said, "There is a mistake in the nomination papers (filed by Nikhil Kumaraswamy) and the official machinery has been working to cover up the issue. I have received information that the chief minister had invited the deputy commissioner home and spoke about the same. 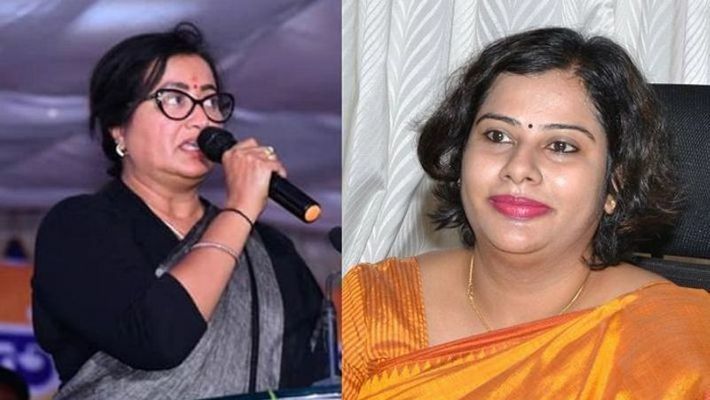 It is a violation of law..."
Following this, Mandya deputy commissioner Manjushree has issued a notice against Sumalatha demanding that she responds within a day. The notice has been issued under IPC section 189 stating that Sumalatha, while talking to the media had portrayed the district administration in bad light. “This has besmirched my image damaged my social identity. Sumalatha's statement suggests that district administration is being misused by the chief minister,” she stated in her notice.